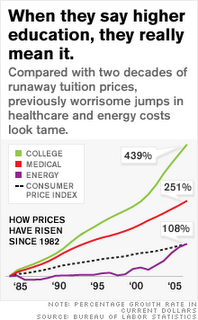 Little known in America (except for a select few such as FMMF regular readers) is that the cost of college in America has been inflating at a pace that actually surpasses the much more publicized healthcare. [Dec 14, 2008: WSJ - K-12 Schools Slashing Costs, College Bills Wallup Families] [Dec 5, 2008: NYT - College May Become Unaffordable for Most in US] As always, we are very early to a crisis but I see one developing here. In fact, based on some information I discovered some 6 months I see 2 developing - the latter displaying America's full on ponzi scheme financing for everything. First the obvious - there are 2 sectors highly subsidized by the government in what is apparently good intentions - healthcare and higher education. But since there is not market based pricing, those are the 2 sectors where costs have run far in advance of wage growth for multiple decades. So what does that lead to? You guessed it - the need for ever higher subsidization as the gap between what people could afford out of pocket and what a highly subsidized sector charges. In fact, this incentive program actually incents the healthcare and education fields to charge higher than they need? Why? Why not! Just about anything they charge - the federal government will subsidize to "do the right thing". There is no price sensitivity in these sectors - heck our drug lobbyists have been successful in blocking price negotiations by the largest buyer of drugs on the planet. Only in Cramerica do you lose efficiencies of scale... in any other country (or in the private sector) the largest buyer would use that power to get LOWER prices. But politicians need to win elections and without corporate dollars... well you know how it goes. Eventually we will get to the breaking point where the ROI (Return on Investment) of going to college is going to outweigh the salary variance between those who graduate college and those do not. The high school graduate will continue to get lower wages but will start his/her working life 4 years earlier and at age 22-23 will have little to no debt, and a 4 year head start on savings. Whereas the typical American graduate now is in the low to mid $20Ks in debt at that same age and many struggle (in the new paradigm service economy) to locate jobs that pay much higher than the high school graduate. Tough to pay off that college debt working as a barista. But these strains are only going to get worse as tuition continues to inflate at its 8-10%+ rate... the college graduate of today leaving with $24K in debt is going to be the college graduate of 2022 who graduates with $43K in debt. Don't ask what the college graduate of 2032 will be leaving with. That's crisis #1 - one we've been talking about for quite a few years. Recently I found crisis #2 - a factoid I bet 95% of americans do not realize was passed a few years ago. I often tell everyone I know to get into government (or pseudo government) work - the private sector is no longer worth it. Pay is better, benefits are far better, and job security is through the roof. [Nov 29, 2010: On the Safety of Public Work] Now I have one more reason for you to seek employment in the public sector. We have a new ponzi scheme in America - all public sector workers (not just city workers, but any who work in non profits such as schools and hospitals) can default on all their loans from the federal government after 10 years. Yes sir... if the higher wages, benefits, [Aug 11, 2010: Federal Workers Benefits Now Approaching Parity with Wages in the Private Sector] and job security were not enough of a reason to attract America's best and brightest, they had to throw the carrot of walking away from your debt (strategic defaults for college!) on top of it. It is called the Public Service Loan Forgiveness Program. Here is the link right there on the government's student aid website. Now I used to think 'public service' meant something like going to a impoverished Latin American or African country - spending 2 years overseas for little pay but gaining experience. But now even those folks who retire at age 52 with $100-200K pensions (or more) plus the full benefits package are doing 'public service'. At least in the government's eyes... and surely they are not biased. Here is the real kicker... (it's amazing when you put all these pieces together). Sallie Mae - which was in tremendous financial distress due to the loans it was servicing, as a private/public loan providers (sort of Fannie Mae for student loans) was instructed by the federal government in 2009 to stop offering private sector loans. Instead Uncle Sam would be the source of ALL the lending for Sallie Mae. Because only loans students take out from Uncle Sam (who work in the public sector.... as a 'service' of course) are eligible for "10 years and default". By eliminating private sector loans go forward, all of Sallie Mae's loans will now be eligible for default. I believe we call this a win-win in modern day America. Or a Ponzi scheme of epic proportion. How big of a cost are we looking at? In the fiscal 2009 year that was a $90B bogey. As the cost of tuition goes up we can expect that to increase annually - especially since you can be sure the government will (just like our mortgage market) take up more and more of the lending - after all the government doesnt care about making money on loans, so they will offer the easiest terms. So $90B (and growing) per year can easily be in excess of $1T in a decade. If market share holds constant and does not increase - which I am sure it will (who can compete with the government's terms?) About 25% of American workers are eligible to go into these 'public sector' jobs (again it includes schools, hospitals... not just city, state, federal government work). Hence in a decade at minimum $250B of loans (25% of the $1T) or so should be eligible to be strategically defaulted on - we just have to educate our youth on the opportunities for them to default so they can take advantage of this quite wonderful option. The takeaway is it's even worse than I imagined as I only focused on crisis #1 these past few years. Crisis #2 is seeding right now and in about 8 years the taxpayer of America should begin to hemorrhage the losses from "Bailout Nation" as the leading edge of those poor souls who sacrifice themselves for "service to the country" begin to default en masse. Either way, I am attaching myself back to the matrix as all is well in the world, but wanted to highlight that CNBC has a special that premiers tonight (and I am sure will be replayed often) that will discuss crisis #1. Crisis #2 we'll have to wait until 2020... I believe that special will be called "The 6th Largest Ponzi Scheme in America - Strategic Defaults of University Debt by Public Sector Workers". To conclude, I repeat once more - all of us in the private sector are bona fide idiots. Every incentive program in the country caters to the public sector. Now not only do the public sector get wonderful benefits & pensions (some in the hundreds of thousands per year) in their (early) retirements, they also will be able to walk away from debts accrued in their youth. It's a good life.... who says we don't have people enjoying a European lifestyle?